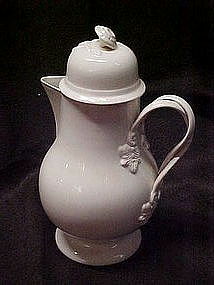 Amazing creamware coffee pot with lid. Pristine condition. Stamped into the bottom, Leedsware Classical Creamware England. Measures 10 1/2" tall.I'm not knowledgeable about creamware. This one is not marked Staffordshire though. Delicate woven handles with a simplistic floral design where the handles attach, and floral finial on top of the lid. Pristine creamy color with no flaws or discoloration. As perfect as they come! I will be listing the matching creamer and sugar also. Not sure of the date.